Apple announced a few new and great products on Sept. 9. But what does it mean for designers? Whether you were impressed with the keynote or not, we can all learn some lessons about what was said during the presentation. With more products to choose from, there are many things that will impact designers. It’s obvious with two new iPhones that as designers we now get to worry, or enjoy, more screen diversity. Designers are biased toward iPhones – just take a look around Dribbble and show me the Android shots. The one easy thing iPhones provided was stability in size. But that’s not the case any more. With the addition of the addition of Retina HD we have one more resolution thrown into the mix as well. For more information check out the PDF that Lemonat Studio put together with great details about the four iPhone types. Having more screen sizes allows us an opportunity to embrace responsive design skills. Responsive design can be flexible and we should use that to our advantage. With two significantly bigger iPhones, we have the to opportunity to be more creative with responsive websites. At the very least, we will get better at testing responsive websites with bigger smartphones; this will work in favor of all the big Android phones out there as well. Who knows, maybe we will start caring about tablets too in this regard since the iPhone 6 Plus is almost the same size as the iPad Mini. One awesome thing that Apple pointed out about iPhone 6 Plus was its screen size when the phone was horizontal. It’s refreshing to see emphasis put on horizontal design for once. Let’s face it, it’s not something we do often with either apps or responsive websites. However, we should and now we have an opportunity to do just that. Let’s embrace the bigger screens and get creative by creating fascinating and beautiful apps in horizontal and vertical screen rotations. 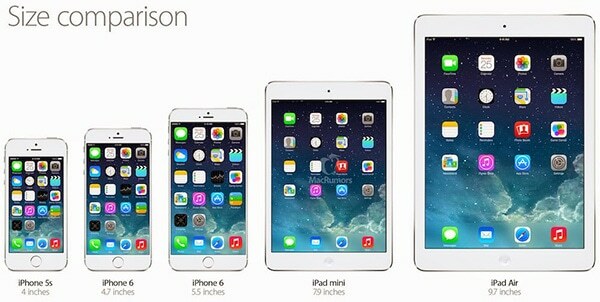 Like it or not, with Apple introducing two new iPhone sizes design will be significantly impacted. We have two options, cop out and simply scale the designs appropriately or embrace the challenges and allow ourselves the opportunity to create new and better designs for those screens. 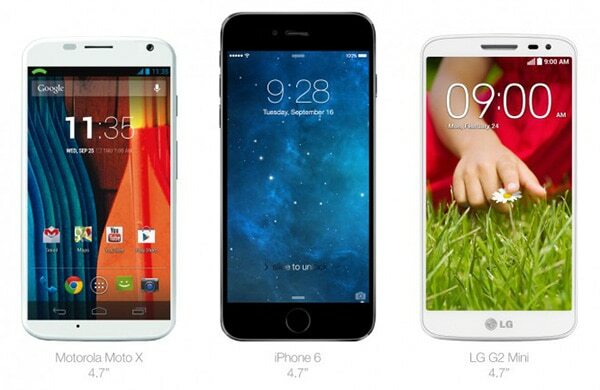 Yes, I know Androids have been around with bigger screens significantly longer. But, for some reason designers are biased towards iPhones. Often, clients are concerned about iPhone apps first as well. This could mean that since iPhones are now the same or similar in size we can finally embrace design for both phone types. The new watch Apple introduced, Apple Watch, is unlike other Apple devices. It’s customizable, personal and small. Unlike iPods, which too had small screens once, Apple Watch can have apps. This is important, as we will be designing those apps. Apple Watch has limitations, like the fact it’s first generation and its tiny screen. This will mean two things. First, we might embrace the small screen and find its limitations a glorious creative challenge. Or, we will shy away from the watch. Wearables are just starting out so it’s hard to embrace them, as they are not a perfect device yet. Therefore, the second option could mean the Apple Watch will become a lost medium like iPads. But it is great to see that Apple is trying to explore wearable technology. Whichever way the design community will go about Apple Watch in the future, one thing is for sure, that right now Apple Watch is a hot and exciting device. This poses a big question: What will Apple do next? 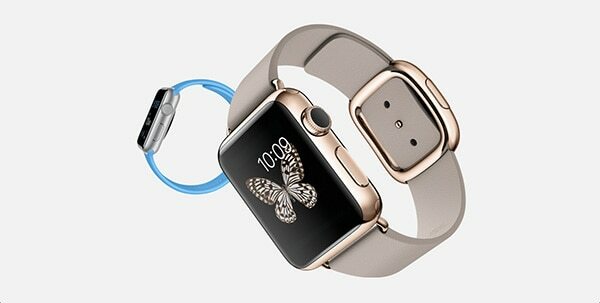 It’s my guess that in the future Apple will branch out into other products and other technologies – including wearables. This is especially true because of the new bigger iPhones. Apple is starting to diversify. The keynote was certainly an eye opener. Apple is no longer the company it once was. It’s obvious to point out that it’s the difference between Tim Cook and Steve Jobs, but it’s not as simple as that. The company is doing more things differently and it can be a bad thing if you view it as a change between CEOs or a good thing if you realize that Apple is just another corporation. Either way you spin it change within Apple is among us. If you take a look at the last few iPhones, iPods or iPads you’ll notice that they are significantly different from one another. Apple’s products used to have a signature similar design. Previous Mac OS versions have been similar in design to previous, like iOS6 and Maverick. iPads have been made in the image of iPhones and iPods have been changed in design to match iPhones, too. Now, Apple products are diversifying; latest generation of iPods are totally different than current iPad, which are different than the Apple Watch, and that’s different from … you get the idea. This simply means as designers, we should anticipate working with various designs and styles. I have chosen iPhone over Android because I trusted the designers and engineers at Apple to provide the best experience for me. I don’t need to customize and I trusted in the experience because the designers are the experts after all. I know I’m not the only one. The watch is not fully customizable, you can’t pick different shapes — like circular versus square watch — it’s still a very different approach then any other Apple product before. As designers we will be exposed to a varying styles within Apple’s design. It’s going to change the way we will develop for the devices and how the design of the devices themselves will inspire us moving forward. What is your opinion? How do you think Apple’s recent announcements will impact the design community? Since when pro designers (not circlejerking amateurs on Dribble, Deviantart and such) while designing for web and mobile do it for iDevices screen sizes only? Do you know that present iPhones’ screen size has been covered long time ago by Android phones? It’s just a trend to show mock-up within iWhatever but I have strange feeling that it has nothing to do what’s really covered within media queries? Answering your question: it will not affect anyone who is a pro. It will only affect Dribble as new mock-up will be presented with new apple phones as backdrops, that’s all. Borysses makes a very valid point. Designers that are “biased towards iPhones” are not really working at industry level. But let’s assume more designers are inclined to buy Apple products themselves (which is likely the case), therefore they may design for that platform first. Apple releasing bigger phones with a variety of resolutions should only help close the gap between iOS and Android design incapabilities, because the “biased” types will start thinking about larger screens. I think those that have been designing for Android won’t see the release of the new phones as a game changer, and those that haven’t will hopefully create design that will become compatible with more devices and platforms. Totally agree here. I’m a designer who is biased towards PC, Android and Windows Phone. but any designer worth their chops should be thinking well beyond a single phone or device, otherwise what the hell are they doing in this industry? iPads are a “lost medium”? How so? Millions of iPads have been sold and continue to be sold each day. I use my iPad Air every single day without fail.